Day two of the Acumatica 2018 concluded today and we were treated to a lot of new announcements and product updates, here are some highlights. 73% of Acumatica employees work in Research and Development – Quality drives development priorities Acumatica announced plans for 2018 that include investment in re-development of the Core Platform, and explained this foundation to the solution ultimately drives quality in the product. Loads of new features in the core product coming in 2018 xRP Platform will continue to be a huge USP for Acumatica with lots of new functionality. New Feature in Acumatica 2018 R1 – Business Process Monitoring The Business Process Monitoring features allows even more automation configuration in Acumatica to streamline business process and set up integrated workflows. Acumatica CTO explains an automated Quotation follow-up process as an example of how this tool can be used. Integrating with New Technology Acumatica excels at integration and interoperability with external systems due to the modern nature of the framework. Several demonstrations were done to show examples of how Acumatica can leverage Artificial Intelligence and Machine Learning as these technologies become more applicable to a modern business. Ajoy Krisnamoorthy, Acumatica VP of Platform Strategy demonstrates real-time integration with RFID scanners which confirm correct items on the order, as can be used in a distribution environment. Bonus points for hilarious dig on the competition!!! Numerous other announcements and partnerships with leading technology companies such as Google were highlighted. 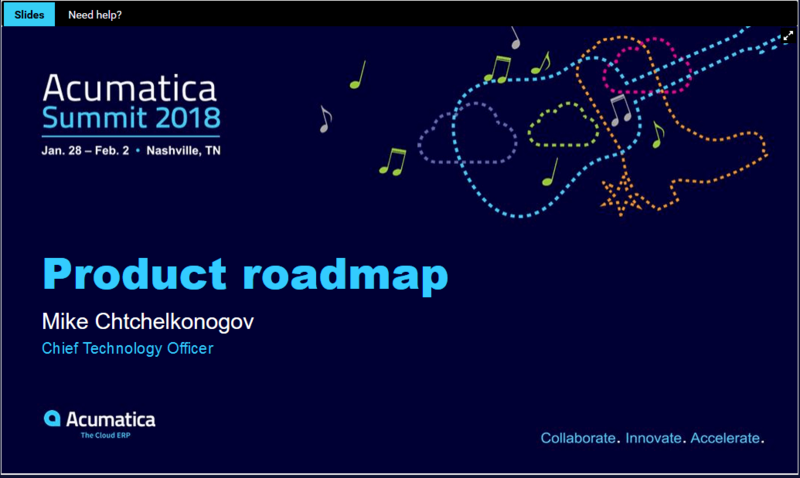 Acumatica’s future outlook continues to look amazing, record growth, incredible new product features and developments, and a product roadmap that in our opinion is moving faster than another other solution in the market. We will keep you posted with further updates, thanks for tuning in! !